To provide an invaluable link in the Customers’ supply chain by combining effective transportation solutions with a unique understanding of international Government and Customs regulations. To be known by industry as the most innovative and widely qualified forwarder in our field whilst being recognised by Government authorities as ethical, influential and dependable. 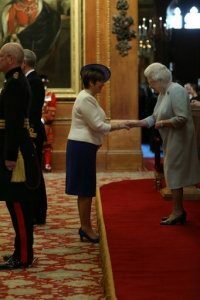 Our Compliance Manager, Bernadette Peers receiving her MBE for Export Control Services from HM The Queen in 2018. We are a privately-owned freight forwarder based in London, UK. Founded in 1985, we work with most major international defence and aerospace firms. We are directly contracted to 7 out of the 10 Largest Defence Companies in The World – CEOWORLD 2015. We offer a comprehensive in-house range of services from storage, transport, customs brokerage, freight forwarding and training to our UK and international client base. This is linked to a strong ERP/MRP offering to complement the physical services. Our staff are the best combination of young, dynamic logistics professionals managed by supervisory staff who have been with us for years and are recognised as the sector leaders.